I am in a great mood today! My end-of-year paperwork is DONE and submitted. If there is a part of this work that I don't like, and maybe even stronger than don't like, it is the end-of-year paperwork. I have many separate permits, so that task is daunting. I spend much of January crabby in anticipation of the inevitable. We will be catching up eagles this morning and doing the exit exams for them. I will get photos as we do this today and post them through the day. It is a full day. 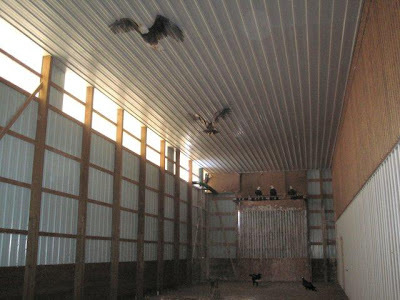 First we have to catch the eagles to be released in the large flight building. We have 10 eagles in the building now, so that in itself will be a challenge. The eagles that are being released are back to 100% wild Bald Eagle at this point. They are fully recovered from whatever issue they had; they are fully conditioned so they have endurance, and they have honed their skills and are prepared to catch their dinner tomorrow night. The conditioning is a major element to the success of the birds once they leave us. As an example, it is much like a person running a marathon after being ill. If you crawl out of your sickbed and take off running that marathon, you might make it out of the driveway, but there is zero chance you will make it to the end of the race and be alive. Conditioning is important to any athlete and raptors are amazing athletes. Raptors are especially at risk if not conditioned well, as they not only have to fly, but, as predators, have to catch their dinner. Their wings and flight have to be perfect. They have to be able to make sharp turns and dive and do all the things that any wild eagle does. To do aerial acrobatics birds have to have perfect feathers. A broken-off tail is the same as an airplane missing part of its tail section. Birds are shaped perfectly for their life in the wild. If we compromise that in any way...like broken feathers on the wings or tail, we might as well keep them in captivity, as their chance of surviving is not good. The eagles we will catch up today for exams have not been "in arm" for at at least two months and longer in the case of one of the birds. They have no "tameness". They just want to get out of here and get back to their life as it should be. 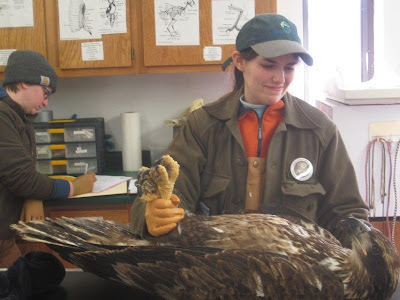 We will weigh each of the eagles and check its body mass as well to make sure all the muscles are recovered and equal. When a bird has a fractured wing, it is exactly like a broken arm in humans. The affected side remains weaker without physical therapy. One of these eagles was hit by a bus. Honestly, hit by a bus! He had a broken wing and a broken leg, but if you are at the release, you will not be able to notice anything about him different from the wild eagles that are in the area. That is how it must be. Each eagle will have its eyes checked and feet "pedicured" to add extra lanolin that it will need once it is released. The feet of any raptor are ultra-important. This is what they hunt with, and the feet have to be perfect. Getting a patient release-ready is complicated. We are giving them a second chance at life. They have all come so far. I don't want something that we neglected to do to alter their course. My staff ( and family) will tell you that while in most of my life I am pretty laid back, when it come to the birds... I am the opposite. 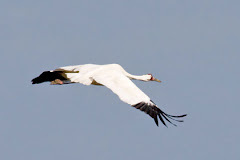 And for those of you who wonder if I will miss the birds that are being released, I always think of them. 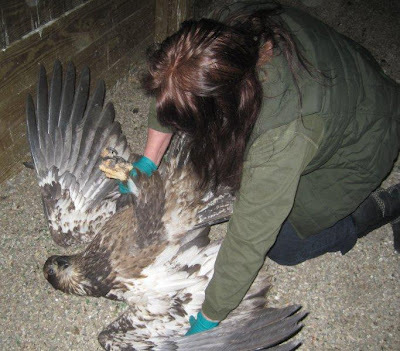 I have cared for and released hundreds of eagles and thousands of other birds, and yet I can remember each case. Never for a second do I long to have them stay with us. They are wild, and our work is to get them back into the wild so they can start again. I am off to catch up some eagles, get some photos to share with you, and then prepare the van for tomorrow.